In 1968, a play called The Great White Hope opened on Broadway. 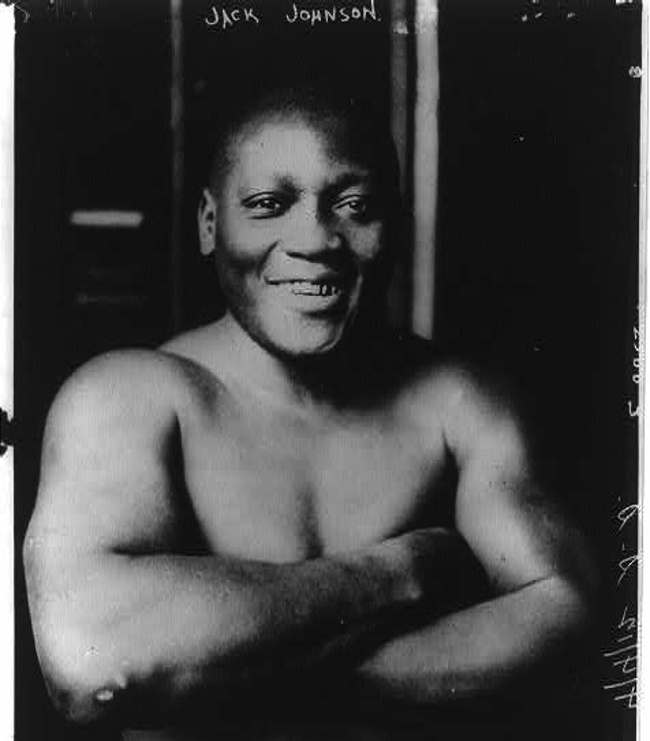 The protagonist was a boxer named Jack Jefferson, but the story was based on the life of Jack Johnson—the first African-American heavyweight boxing champion, and a man who was once sentenced to prison for his affairs with white women. The play won the Tony and the Pulitzer Prize, but it also appealed to another controversial heavyweight champion. "That's my story," Muhammad Ali told the play's star, James Earl Jones. "You take out the issue of the white women and replace it that with the issue of religion. That's my story." This week marks the 70th anniversary of Johnson's death in a car accident. And while Ali lived out his later years as an American hero for his stances on the Vietnam War and social justice, the same could not be said for Johnson, a brilliant man who died at the age of 68 on June 10, 1946, when he wrapped his Lincoln Zephyr around a power pole after being refused service at a roadside café in North Carolina because he was African-American. After years of effort from filmmaker Ken Burns—who released a documentary about Johnson, Unforgivable Blackness, back in 2005—and various political figures including Senator John McCain, Johnson is inching closer to being pardoned for the supposed "crimes" that landed him in prison in the first place. But as Ali acknowledged at the height of his fame, there may not have been an Ali in the first place without what Jack Johnson endured before him. "He was scandal, he was gossip, he was a public menace for many, a public hero for some, admired and demonized, feared, misunderstood, and ridiculed," wrote Dr. Gerald Early, the essayist and culture critic. Johnson, the son of former slaves, grew up in poverty in Galveston, Texas, worked his way up through the ranks of boxing, the hard way. He won the heavyweight championship in 1908, then defeated white boxer Jim Jeffries in 1910 in "The Fight of the Century," a result that triggered race riots across the country, resulting in the death of at least 20 people. Away from the punishment he gave and took in the ring, Johnson embraced the good life. He had his own jazz band. He owned a Chicago nightclub, drove fast cars, carried a gold-handled walking stick, and dated a number of high-profile women, many of them white—from the German spy Mata Hari to starlets Lupe Velez and Mae West. And this is what would eventually land him in prison. Johnson was married three times, all to white women. His first wife committed suicide in 1912 in Johnson's Chicago nightclub; by then, the government was already trying to put together a case against him under the Mann Act, a newly passed law designed to curtail prostitution among working class women. The Mann Act prohibited the transfer of women across state lines for immoral purposes. Three months after Johnson's first wife died, he married a white prostitute, Lucille Cameron. That shielded him from prosecution, since Cameron couldn't testify against her husband, but it also made it seem, Early wrote, as if "Johnson was simply thumbing his nose at the racial and moral conventions of his society." But the government found another white prostitute, Belle Schreiber, with whom Johnson had been consorting on and off for years. He was found guilty in 1913 of violating the Mann Act and was sentenced to a year and a day in prison; in response, Johnson jumped bail and fled to Europe, where he stayed until 1920. He kept fighting because he needed the money, and lost his heavyweight title to Jess Willard in 1915, thereby returning the heavyweight title to a white champion. And then Johnson spent the remainder of his life trafficking off his celebrity. Johnson fought in exhibitions, told his life story at flea circuses, appeared in a few movies, and took out a patent for a wrench he'd designed in 1922, although that never caught on with the public. Sometimes he performed as a musician. He married another white woman in 1925, and this time wound up staying with her for the remainder of his life. He also never lost his passion for automobiles, and particularly for fast cars, which, as Early writes, were "the most celebrated piece of popular culture connected with new technology ... part of the brave new world of the early 1900s." It was that need for adrenaline and speed that eventually proved his demise. When The Great White Hope was first performed, many people actually thought it was a metaphor for Ali's life. In many ways, Early writes, Ali and Johnson were not that much alike, "other than being black heavyweight champions who were convicted for violating a federal law." But as time passes, and both Johnson and Ali fade into history, it becomes easier to recognize the lineage, to see how each man was impacted by and made an impact upon the eras in which they lived. "I loved him because of his courage," Johnson's third wife, Irene Pineau, said at his funeral. "He faced the world unafraid. There wasn't anybody or anything he feared."